It’s the home of technology, retail and real estate giants such as Microsoft, Amazon, Starbucks and Zillow so it’s no surprise Seattle captured the top spot on WalletHub’s 2018’s Best Big Cities to Live in list. The Emerald City ranked first in economic strength and access to the quality education and health services, and sixth in overall quality of life, according to the WalletHub analysis published on Monday. 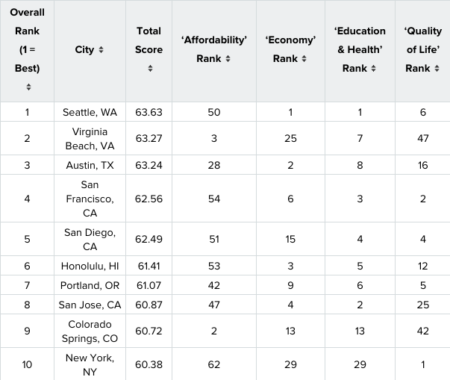 But the city faltered when it came to affordability and safety, ranking 50th and 30th, respectively. “Big cities represent opportunity, economic and otherwise, which appeals to people of all walks of life — especially young professionals seeking advancement in their careers and social lives,” wrote the study’s authors, who ranked the nation’s largest cities based on affordability, economy, education and health, quality of life and safety. The top 10 big cities to live in. Virginia Beach, Virginia; Austin, Texas; San Francisco, California; San Diego, California; and Honolulu, Hawaii, rounded out the top five with excellent economic, education and health, quality of life and safety scores. Only Virginia Beach had a high affordability score (3). The 10 worst big cities to live in. 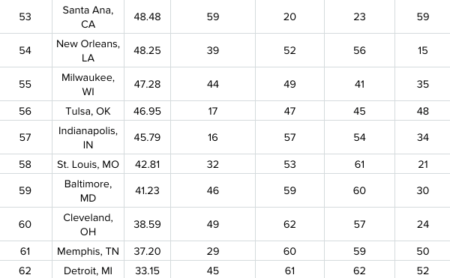 Meanwhile, St. Louis, Missouri; Baltimore, Maryland; Cleveland, Ohio; Memphis, Tennessee; and Detroit, Michigan, were considered the worst big cities, thanks to scores in the bottom third across all five categories. Before hitching up your britches and moving to Seattle, Morgan State assistant professor of city and urban planning Tonya Nashay Sanders-Thach says people mustn’t move just because they like a city’s amenities. Amenities, she says, won’t matter if you can’t comfortably afford the cost of living. “City-living is going to be more expensive than living in a less populated area,” Sanders-Thach added. “How far your dollar has to stretch to cover housing, food, medical, entertainment, etc., in relation to your salary will decisively impact a decision on where to live. Yeske Buie managing director Dave Yeske believes affordability is important, but buyers and renters need to think about the overall quality of life a city offers. For example, smaller towns in rural areas may be less expensive, but access to quality healthcare and efficient emergency services may be hard to come by. A good option for the perfect balance between affordability and amenities are college towns, Yeske said. We evaluated those dimensions using 56 relevant metrics, which are listed below with their corresponding weights. Each metric was graded on a 100-point scale, with a score of 100 representing the most favorable living conditions. For metrics marked with an asterisk (*), the square root of the population was used to calculate the population size in order to avoid overcompensating for minor differences across cities. Finally, we determined each city’s weighted average across all metrics to calculate its total score and used the resulting scores to rank-order the cities in our sample. Our sample considers only the city proper in each case and excludes cities in the surrounding metro area.